The Davis family crest/coat of arms is available and can be proudly displayed on a variety of products, including shirts, mugs, wine glasses, clocks, plaques, and much much more! Below are some of the most popular items that others put the Davis family crest on. Emailed Graphic files for your Families Coat of Arms and PDF files of our most popular product, the Armorial History. High quality mouse pads emblazoned with your Coat of Arms. Dual Family Tree scrolls. Options include 3 and 4 generation depth. With and without full color family crests. This Full color Coat of Arms with Family Crest shown on both sides of this beautiful Stainless Steel Travel Mug. Very durable! Coat of Arms displayed on Plaques and Frames, perfect for presentation in your home. Dishwasher and microwave safe beer steins. Full color Coat of Arms with Family Crest. 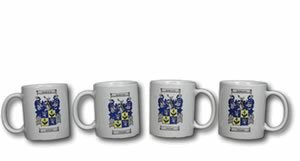 Full color Coat of Arms with Family Crest shown on both sides of these beautiful ceramic mugs. 11 oz. Dishwasher and microwave safe mugs. 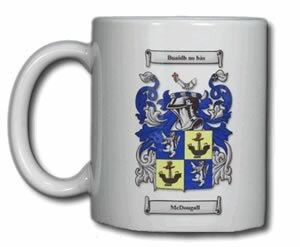 Full color Coat of Arms with Family Crest shown on both sides of this beautiful ceramic mug. 11 oz. Dishwasher and microwave safe mug. Beautiful wall plaque features both family's Coat of Arms. Walnut wood plaque protected by acrylic. 10.5 x 13 inches. Full Family Coat of Arms with Family Crest heat pressed onto a Men's Golf Shirt. 100% cotton. Full Family Coat of Arms heat pressed onto a Men's T-shirt. Top quality shirts. The Family Crest Shop is an independant resource of family crest and coat of arms products. All links for purchasing products are links to external web sites. Our goal is to provide a complete list of options available to you as your look for coat of arms products. 2019 copyright, Introspect Development, Inc.